I pulled up my blog site this morning to write this entry and I can’t help but laugh at the irony of the title of my last blog post, “How I Shot Myself in the Foot.” So I guess we could subtitle this one, “How I Broke My Foot”. But it is really more about what I am learning in this new state that how I hurt myself. If you haven’t had the pleasure of hearing me moan and complain this week, allow me to start at the beginning. I was taking a U-Jam class (think hip-hop, think fun, think the craziest instructor ever), and tripped over my own big feet, putting all of my body weight on the side of my foot before falling and having to crawl off of the aerobics floor in pain. It hurt my foot, and my ego. It also confirmed to me why I teach weight lifting classes and not dance formats. I limped around the rest of the day on a swollen and discolored foot hoping it was nothing serious and would get better. But by the next morning I decided I needed to get it x-rayed. Sure enough, I had fractured a bone – an avulsion fracture – which I had never heard of. The doctor explained to me that instead of having a crack in the bone, I actually had a piece chip off. And you can see it hanging out by itself in the x-ray. Weird. So now I have a stabilizing boot and have been told not to put any weight on it. This does not fit into my life. I have been a group fitness instructor for over 13 years. I am a task oriented person who thrives on accomplishment and feels huge satisfaction every time I cross an item off of my to-do list. And now I have a useless foot. What? I can go bat-crazy just thinking about having to sit still for too long. And let’s face it, I’m not the only one. Our American culture praises those who “do”. If you are busy, you are a good, contributing member of society. “Rest” is not an item on anyone’s to-do list. And I tend to put even more pressure on myself that the average busy woman. I work in an industry that measure how good you are with how active you can be. How far can you run? How much energy can you bring to class? How much weight can you lift? As I’ve mentioned before, I also have a hard time asking for help. But now I’m grounded. Unable to complete many everyday tasks on my own. This is so hard for me. I’m feeling helpless and weak. 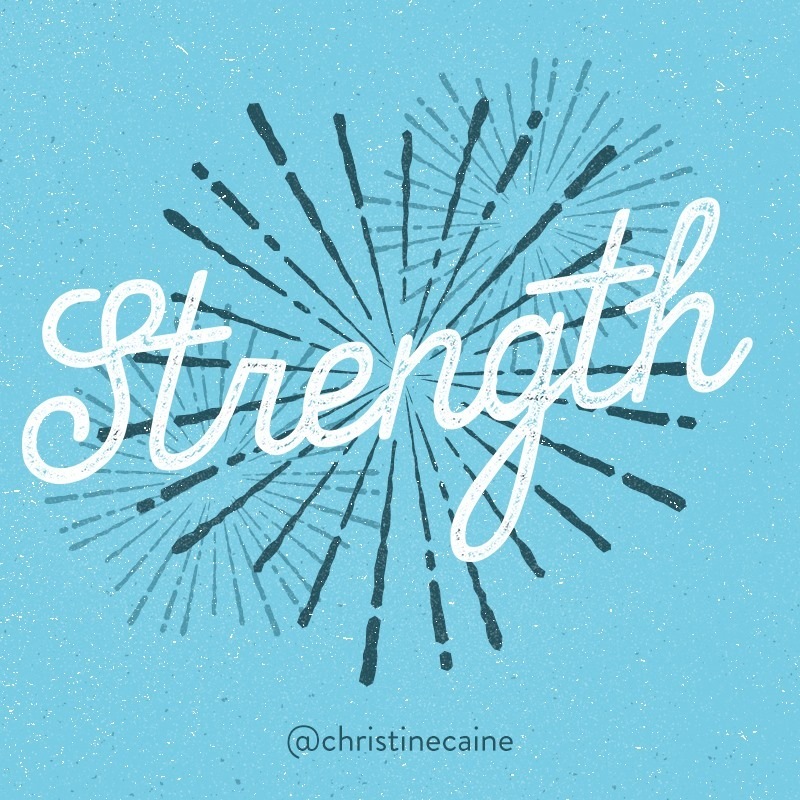 It’s a good thing God doesn’t measure strength the same way I do. In 2 Corinthians, the apostle Paul tells us that he has a thorn in his flesh that keeps him from becoming proud. We aren’t told what it is that troubles him, and I think that is deliberate. Paul wants to speak to us about how we can deal with ANY weakness, so by not naming his, we can all relate. Some scholars believe it was a sin in his life that he could not seem to set aside. Some think it was an injury or illness. It could have been a person who was difficult to get along with. Or the paparazzi! The point is that Paul felt tormented and weak. He writes that three different times he begged the Lord to remove this trouble from him. And he records God’s response, “Each time he said, ‘My grace is all you need. My power works best in weakness.’ So now I am glad to boast about my weaknesses, so that the power of Christ can work through me.” (2 Corinthians 12:9 NLT) As is often quoted, God doesn’t call the equipped, He equips the called. God can use anyone, and He does. But if you are a rock star (figuratively speaking), your works will most likely be seen as a product of your talent or brawn. How much more obvious is the work of God when accomplished through someone who could NEVER do it on their own. Someone lame. Someone weak. Romans 8:28 says, “And we know that God causes all things to work together for good to those who love God, to those who are called according to His purpose.” Although I don’t believe God caused me to fall down, I do know based on this verse that He would not have allowed it to happen if He couldn’t use it to further His kingdom. And so I sit on this couch with my feet up. I resign myself to chair aerobic videos intended for the deconditioned elderly for my workouts. And I try to relax into Him. I’m resting (or at least I’m trying to) in His promise to use this – and me – for His glory. My God can do that.